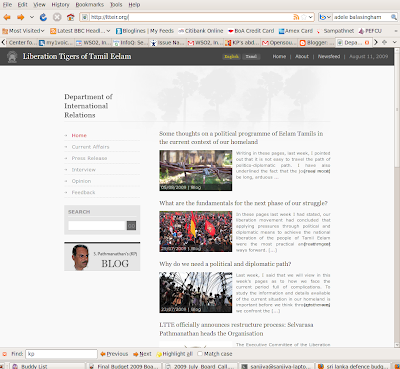 A while ago I blogged how LTTE's global arms procurement person (and their "head of international relations") was still absconding. Well, no more .. KP is now ours :-). He was nabbed in Malaysia by Sri Lankan military intelligence folks and then brought to Colombo .. now being interrogated. He's a PRIZE catch - he set up and lead the arms procurement and delivery networks as well as handled their $200-300m annual income (profit). There have been reports of a major power struggle within the remnants of the LTTE (including this story about the battle to take control of its drug trafficking wing), especially to control the vast sums of money they (still) have .. and KP was the winner. Well, no more. India has already asked to get to KP .. as I'm sure are US intelligence folks given the reality of resource sharing by terrorist groups. He's going to be tried in Sri Lanka. There's no way he'll ever see any freedom again and I don't see Sri Lanka extraditing him to India or anywhere else .. but I'm sure the Indians and Americans will get their chance of chatting with KP. KP was the last piece of the puzzle to give the deathblow to the terror of LTTE. RIP. No, RIH. Absolutely brilliant of our intelligence folks to track him down (when Interpol which had an arrest warrant for him for years couldn't (or maybe didn't want to? )), grab him and bring him back home for chit-chat. AFAIK this is the first international operation by Sri Lankan intelligence. And the funniest part of the whole thing: LTTE is upset that he was nabbed and says his nabbing was illegal. At least these guys have a great sense of humor! 'Aunty Adele' is actually and Australian, and probably not too welcome here either. Attempt away this beneficial ave to facilitate get something done a straightforward rearrange mobile phone search with the intention of phone number lookup hit upon away who is bringing up the rear that cellular phone number. As well as you can also spend this mobile phone number search to get something done a telephone lookup as regards that liar. Plus yet via a annul lookup know how to make the repeal phone method the superlative thing you be capable of increasingly carry out rider you deem a propos it in our day.